Categorías Iberico Acorn fed Ham, pure Pata Negra. Did you know you may distinguish up to 7 different flavours in an Iberico ham, depending on where you cut? 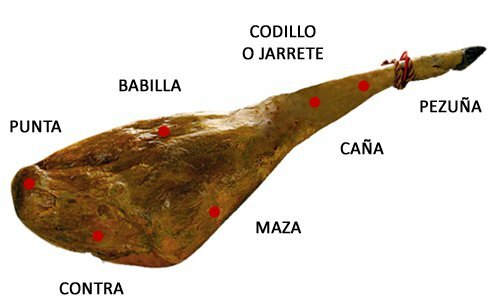 The appropriate temperature to slice an acorn Iberico ham is around 24º C (75° F), this way the fat will melt and the knife will make a perfect cut. Maza. The main zone, it is the biggest, juiciest and most flavourful part of the ham with the most quantity of meat and very rich in flavours. The flavour is mild and sweet, regarding aftertaste one can feel almond and even mushroom notes. Contramaza The finest part of the ham and therefore the most cured, besides it has less fat than other parts. Its flavour is balanced and lasting, showing hints of nuts. Babilla is the part between femur and coxal bone, so it offers less meat than maza. It is recommended to begin cutting this part of the ham so the ham will be better preserved and we will be able to make the most of our ham. Punta o cadera. It is the opposite side of the paw. It is the most flavourful part of the ham with the maza. The meat has been cured perfectly well and offers the exact quantity of fat. Due to gravity when the ham is hung to dry, this area concentrates the most part of oils and flavours. The aftertaste is strong and even spicy. Caña o jarrete. It is between the shinbone and fibula. As this meat is normally harder and fibrous, often is cut in cubes. Its flavour is intense, spicy and juicy. Codillo. The closest area to the paw. It is also fibrous with an intense taste. It is between the caña and maza. Bones. The seventh flavour are the bones that once the ham is consumed are sawn in pieces about 10 - 12 centimeters and used to prepare exquisite soups. A whole Iberian Ham or trimmed and packaged Iberian Ham?